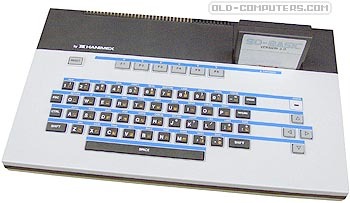 This Australian computer was in fact built and conceived in Hong Kong by Soundic Electronics, which produced a lot of low-end products at that time. The high-resolution (256 x 192) can only be accessed with at least a 16k RAM extension. The Basic (SD-Basic 2.0) is supplied on a ROM cartridge, it allowed to display up to 32 sprites. The Pencil II also came with an interesting expansion cartridge. The regular cartridge port was the exact same size as a Colecovision cartridge, and when you plugged the "Colecvision Support" cartridge into the side of the unit, it played regular Colecvision games. see more Hanimex PENCIL II Ebay auctions !